Lily Lemontree: A Dog Walkers Duty... and Doody! A Dog Walkers Duty... and Doody! To the early morning dog walker. We sure did step in it this morning! And by 'we' I actually meant my children and I. We stepped into your dog's fresh poop but I'm sure you figured that out. We saw you looking over at us, I guess it was kind of hard not to notice my son who was in full meltdown mode, screaming "I just stepped in dog pooh!" at the top of his lungs. I know it was a little loud for 8am so I will beg your pardon for the disturbance but I had to prioritize between reminding him to keep his voice down or wiping all the poop from his boot so that he could make it across the schoolyard without being late AND without dragging fresh dog doo-doo into the school. Remember the little pile that your dog left behind and you skillfully kicked a little snow over to cover? Don't get me wrong, although I do not own a dog myself, I am a dog lover. My issue is not with your cute little pooch but with you, the two-legged, enlightened human being who most certainly understands the responsibilities of caring for a pet in a mindful and courteous manner. I know you love your dog to bits but that doesn’t mean that everyone else would also enjoy a slobbery lick first thing in the morning or to be mounted by your dog, even in the friendliest of settings. Not arguing the fact that your dog happens to be the cutest little thing out there but some people may just not be in the mood for it, and there are many people that are afraid of dogs, plain and simple. Your dog is your best friend but not necessarily anyone else's so keep him/her leashed, close to you and don't allow him/her to run up onto others. If someone really wants to interact with your dog, let them make that decision and approach you. Leashes are not some crazy contraption created to hold back a dog’s freedom as a punishment. They are used as a safety device, for others around you and for your dog as well. Unless you are at a dog park or a designated off-leash area, keep your dog leashed at all times. (Yes, once again I am looking at you neighbour lady who insists on walking her dog off-leash on the path that attaches to a schoolyard EVERY morning, knowing that you are going into a heavily trafficked area full of little kids). Also you can't assume that because you are able to vouch for your dog being the most perfectly well behaved animal in existence, that every other dog you might pass will have the same charming and dignified behaviour as your four-legged friend. What's good for the goose is good for the gander so you can't expect others to keep their dogs on a leash and not do the same with yours. Many people get anxious when they come across a dog off-leash, regardless of the size of the dog so even if your front yard is your property, the sidewalk is not and your neighbours have the right to walk up and down that sidewalk without the fear of getting pounced on or bitten. If Fifi needs a quick run in the grass, your fenced off backyard is the place for Fifi to get down with a little nature. If you want your dog to run free and feel the wind through his wagging tail take him to a park that allows just that. Your dog might be obsessed with your neighbours garden gnome or their gorgeous rose bush but don't let them trample through someone else's garden. That garden could be someones pride and joy, some see their gardens as a work of art, so they might not take too kindly to your doggies messing up their botanical Monets. And while it's your neighbours plants that will bare the brunt of a curious dog, some plants might be harmful to your dog as well. 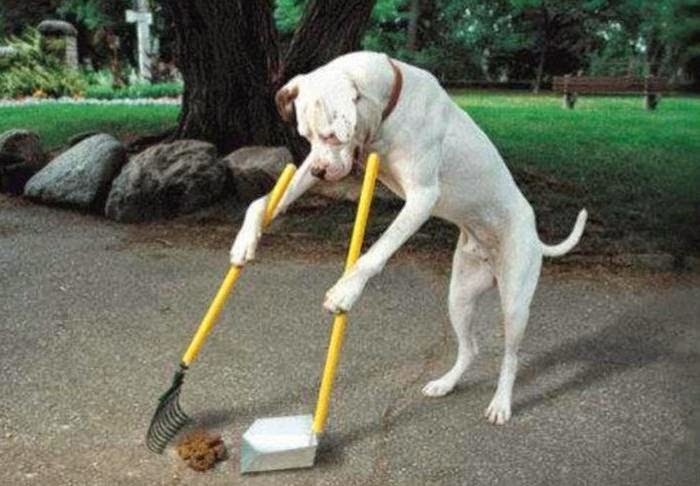 In most cities, there are laws in place about picking up after your dog but it shouldn't take a law for you to act with basic courtesy. You are responsible for the care of your animal, just as parents are responsible for their children. I'm pretty sure I would face more than just a few odd looks if I let my child go #2 on a sidewalk or the park and not take the proper steps to dispose of it. If you are taking your dog out for a walk, ALWAYS take plastic doggie baggies with you, it's not an option. Pick it up, tie it, and get rid of it either in a public garbage can or carry it home and dump it in your own trash can. Have an etiquette or manners question?